Almost Six Weeks - Puppy Fun! Samson is not a rescue but he needs a new home. A working home would be wonderful but a loving home is a must! 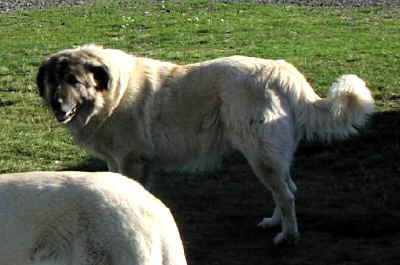 He is an 8 year old experienced Anatolian livestock guardian dog. His flock and other Anatolian buddies have been sold because his owners are retired and have been scaling down. He is available for placement (sale). Please contact Duane Kenny for more information. Phone number is 509-674-5365 & cell number is 509-630-0874, if the home number is busy (they have dial up). Look at that handsome face! The first number on this ad is out of service, the second number is wrong and the email address given gets sent back as undeliverable. Too bad I was interested in finding more out about Samson. Perhaps his owner can correct the information? I posted this on the owner's request about a year and a half ago after which there were some changes as you noted. 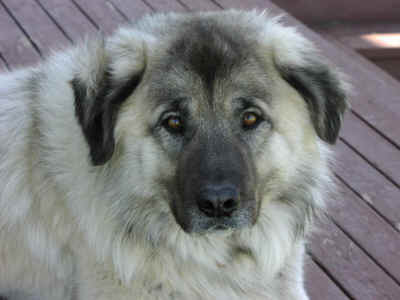 But this month, March 2008, I just got an update, this time from Samson's new owner. Sounds like he is busy working with a new flock that is kidding right now. We might get some photo updates when the craziness of the new babies settles down a bit. :) Thanks for visiting!